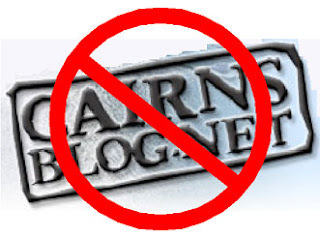 CairnsBlog.net: No CairnsBlog for Council staff! Get used to it guys. It's only going to get worse when the federal government starts imposing it's Big Brother filtering sanctions. My apologies for passing on out of date information. I haven't tried to log on to the blog from work for quite a while, so was unaware the situation had changed. I will be interested to hear the response Di gets from the CEO. If you are a state government employee I think you will also find that access to Cairnsblog is blocked. Me thinks Mayor Val doesn't like you much Michael!!! Bet u a zillion dollars that her fake green paws are all over this. Val is a control freak... you've told us how she's been led by CEO Briggs and co... so put two and two together! She's hardy stood up to the establishment and made it her own since she's been in that place. what a shame.. we all expected way too much. We're on the beaches, and a huge amount of us supported Val and in such a shoirt few months has not done the right thing by us at all. I'd ban this blog too. It's cheecky, dirty, rude, has big words, Syd Walker, says want it wants without any balance, I mean, it's hardly safe for kids, or Councillors. They need protecting. I have just banned the Cairns City Council website on my Myola paddock in retaliation. From now on, if I want to refer to it, I'll use an anonymous proxy server. Hi all, I have spoken with the CEO and Cairnsblog will be able to be accessed again by Councillors. Was my boycott the decisive factor? History will decide. If Council officers can read my website, they can see why at least one local believes that 'filtering' the internet is rather like soaking your glasses in mud.